It’s cold and windy today here in Harker Heights, Texas, where Maggie and I are parked in my oldest son’s driveway. And it’s snowing in Chicago, my youngest son said in an e-mail he sent me today. 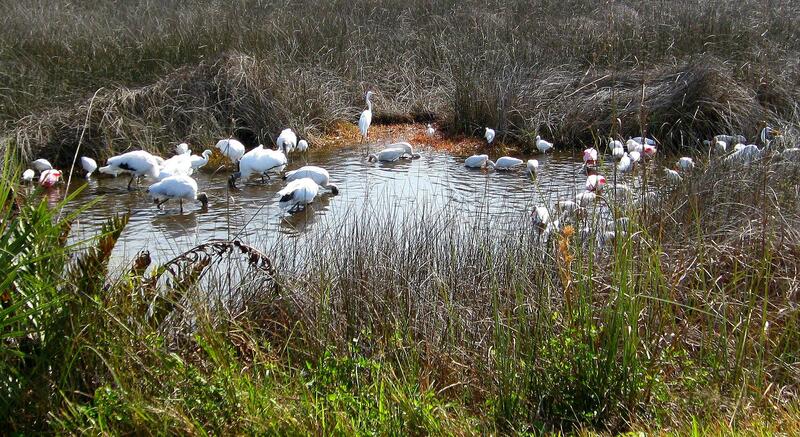 Wouldn’t it be nice, I thought, to be bird watching on Merritt Island in Florida. When I checked out the weather there, I discovered it was a balmy 78 degrees. My thoughts went back a couple of years to the winter day I actually did spend watching birds on the island, which is located near Cape Canaveral. But there’s no getting around bundling up and taking my daily walks with Maggie. Even if she doesn’t care for the idea any more than I do. I wish it was at least cold and crisp. But it’s not, it’s just wet and windy here. It hit the 60s here today in PA… but I think there is winter just around the corner and I am not looking forward to it! Hope your walk was well bundled. They were. And it’s supposed to warm up today here before going back to winter tomorrow.